The course is specially designed for the PhD and master students of the center, but is open to all the research staff, in general. 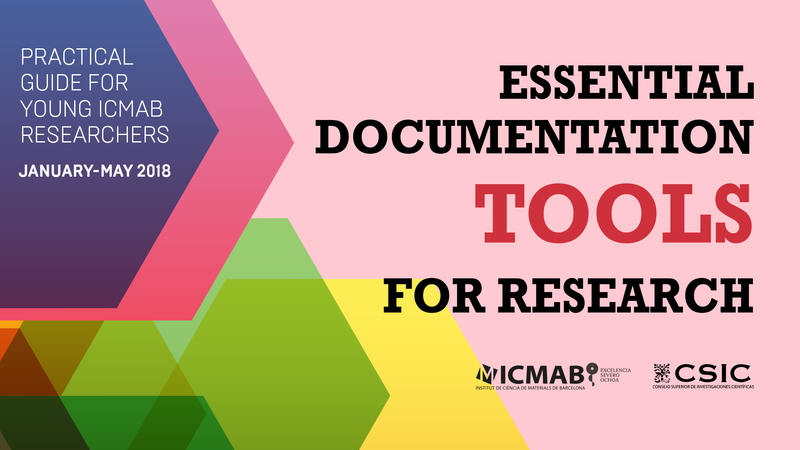 The main objectives of the course are to offer practical, organized and systematized information, in the digital environment, of documentation issues in the specific field of ICMAB and the CSIC; and of writing and structuring research results in articles, theses, oral presentations and posters. The course consists of five modules that can also be attended separately. Each of the five modules will be developed in two 90-minute sessions on two consecutive Thursdays; the first session of theoretical content and the second of more practical exercises, if possible. The total duration of the course is 15 hours. A CERTIFICATE OF ATTENDANCE, total or by modules, will be issued at the end of the course, for those attending 80 % of the total duration of the modules inscribed to. M1 SEARCHING: Searching documents, patents and reference managers. M2. GATHERING: Methods for obtaining documents. M3. WRITING: Guidelines for the writing of scientific articles and thesis. M4. PUBLISHING: Choice of journals to publish, open access, publication and analysis guidelines, and production presentation. M5. PRESENTING: Effective presentation and dissemination of research results in oral presentations or posters. The registration of the course is done by sending an email to Anna May (amay@icmab.es) indicating the desired modules, up to a week before each module. Each module will accept a maximum of 25 students. More information about the content of each module here.